Opioid addiction occurs when an individual becomes physically dependent on opioids, which include opiates and narcotics. Opioids are a synthetic substance found in certain prescription pain medications: morphine, codeine, methadone, oxycodone, hydrocodone, fentanyl, and hydromorphone, and street drugs like heroine. These drugs can be highly addictive, which often lead to misuse and overdosing. Opioids block the body’s ability to feel pain and can create a sense of euphoria. Individuals often build a tolerance to the opioid drugs, which leads them to take more of the medication than originally prescribed. The most dangerous side effect of an opioid overdose is depressed breathing. The lack of oxygen to the brain causes permanent brain damage, leading to organ failure, and eventually, death. 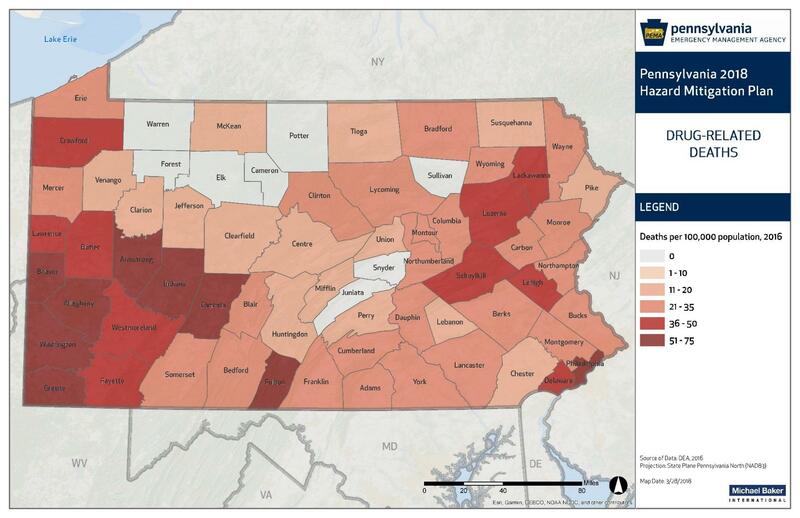 Nationally, Pennsylvania is among four of the hardest hit states from opioid-related deaths, along with West Virginia, Ohio, and New Hampshire. The CDC estimates that nearly 38 out of every 100,000 Pennsylvania residents died from opioid-related overdoses in 2016, higher than the national rate of opioid-related deaths of approximately 20 out of 100,000 people. In Pennsylvania, overdoses caused by opioids have become the leading cause of accidental death, surpassing automobile accidents (CDC, 2017). Between 2015 and 2016 in Pennsylvania, fentanyl use increased 380 percent among 15- to 24-year-olds while heroin use increased 970 percent in the 25- to 34-year age range. There was also a higher percentage of drug-related deaths attributed to opioid use in rural communities at 42 percent, compared to 34 percent in urban communities. First responders—paramedics, police officers, and fire fighters, are also affected by Pennsylvania’s opioid addiction crisis. In addition to the crisis consuming time and resources, first responders also face exposure risk, particularly to synthetic fentanyl. One of the worst examples of the impacts of the opioid crisis occurred in March 2018 when thirteen people in York County died from opioid related overdoses in 10 days, six of which occurred within 48 hours. Pennsylvania has seen a steady rise in opioid related deaths over the last several years, with drug-related death rates increasing 102 percent between 2014 and 2017. If opioid related deaths continue to increase at this pace, then the Commonwealth could experience an estimated 10,000 drug-related deaths in the year 2020. 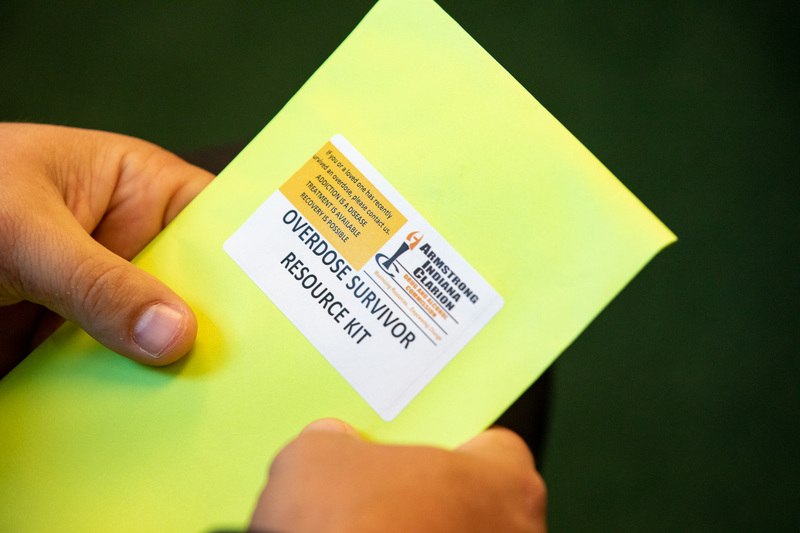 However, future occurrences of opioid addiction and misuse, overdose, and fatalities are unclear as the state moves forward with overdose prevention initiatives. In January 2018, Governor Tom Wolf declared Pennsylvania’s opioid addictions epidemic a disaster emergency. This declaration should enhance coordination and data collection between state and local responders, improve tools for families and first responders, and expand treatment access. Number of drug related-deaths per 100,000 people in 2016 (DEA, 2016). Overdose survivor kit as part of Governor Wolf's efforts to fight the opioid epidemic in rural Pennsylvania. Photo Credit: Gov. Tom Wolf, Flickr.